A delicious and refreshing main for those warm summer nights. Quick and easy to prepare, this is sure to be a hit. 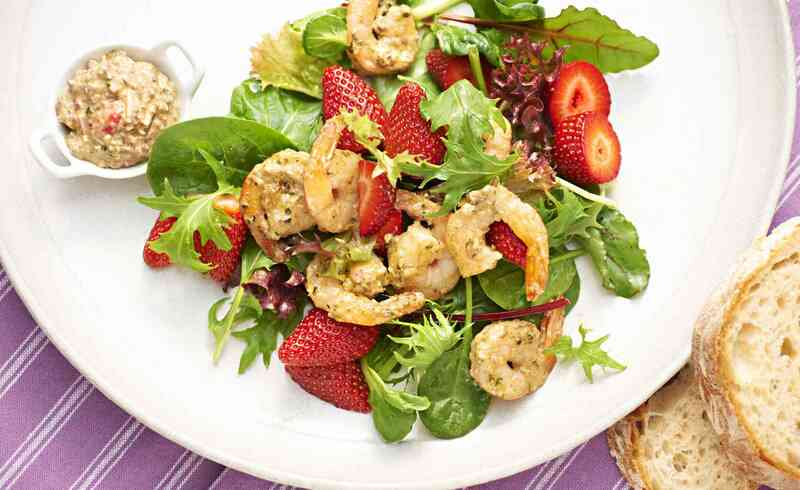 Place the strawberries, basil leaves, walnuts and garlic in a food processor and blitz with the Parmesan cheese. Gradually add the olive oil and mix to a pesto like consistency. Heat a large pan and pan fry the prawns for 2 – 3 minutes each side. Toss in pesto, and strawberries and warm through. Place leaves onto 4 serving plates, top with warm prawns and berries and drizzle with oil if desired. To make the pasta, bring a large pot of water to the boil and cook the fresh pasta. Drain. Toss in the drained pasta and pesto, and warm through. Crumble with ricotta and extra basil leaves and strawberry slices, then serve immediately.